I promise this is my last post about my prom dress. Here’s the first post and the second post. We had prom two days ago and I had a blast! I’m so glad with how my dress and overall look came out. I had so many people compliment my dress, both people who knew I made it and people who didn’t! My date, Alex, wore a bowtie that I made for him and I will admit that his bowtie did not look as good as the other bowtie I made for a friend. This is me and my dorm parent/volleyball coach/directed study advisor. She helped me through all this and supported me the whole way. This is me and Alex, quite the power couple, right? He doesn’t know how to tie a bow tie so I helped. This is Evan’s bow tie. He wanted a Boston Bruins bow tie and I told him as long as he bought the fabric I would be thrilled to make one for him. This is all the girls on my lacrosse team who went to prom. This is a good full length picture of my dress. McCall’s 7456 & Simplicity 6693, from the 1980s & 1970s, have been getting lots of use at my place…ever since I saw the guitar gods in Cracker, both wearing Western shirts at a concert & thinking, “Hey, the Roommate should be able to dress like a guitar god, even if he doesn’t play guitar!” A request from a friend for a similar shirt, led to me making 2 shirts, because I couldn’t resist doing one for his little boy, too. The yoke/cuff/placket contrast for both is from some fabric I got on our trip to West Africa, so it’s authentic wax print. I’m running out of that, though, so used some regular cotton for the main part of the boy’s shirt, and some Marimekko from Crate & Barrel Outlet for the main part of the men’s shirt. Find out more on my blog, Bella Industries, Inc. Unlike most of my vintage-inspired sewing projects, this one isn’t from a self drafted pattern, but made from a late ’50s – early ´60s sport shirt pattern that mysteriously existed among my sewing patterns. The fabric is from a Scandinavian fabric store chain called Stoff&Stil and with such lovely ’50s style rocket ships I just had to have it. Lots of it, it has this far been turned into bed hangings and a wrap dress for my daughter Maja, a dress for me and this shirt. It’s not much left, but it will be turned into a pair of shorts for my eldest daughter. Photos of these things are, or will be when they’re finished, over in my blog. 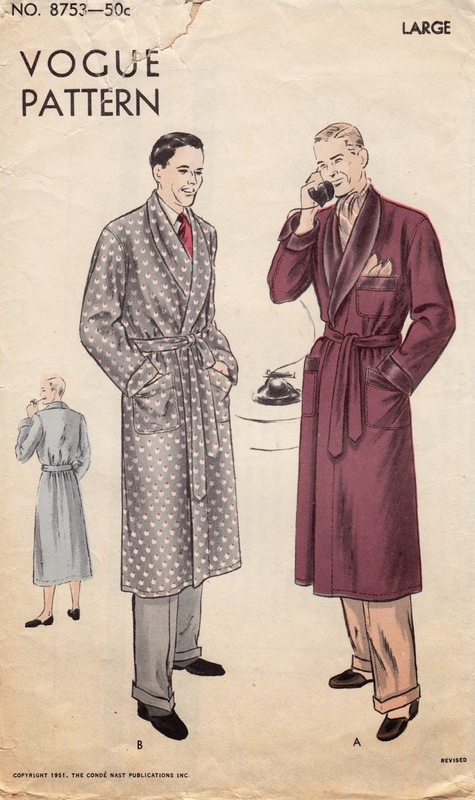 A couple of years ago, I found an amazing vintage Mens’ robe pattern on Etsy and fell in love. I snapped it up, ordered some gorgeous rayon fabric and some ultra-soft micro fleece to line it with. When the pattern arrived I was so excited… and then somehow I never made it. You know how it is, projects pile up, work gets too busy and then before you know it, it’s two years later – no robe. So this year I was determined to sew it for my husband for Christmas, and I was determined that he wouldn’t even know I was sewing something for him. In the middle of finals project and a really busy month at Mrs. Depew Vintage I was sewing this robe like a crazy person. And let me tell you, lining rayon with micro fleece is about as easy as getting a puppy to hold still during a cat parade. I sewed between assignments and studying, before and after work, at midnight while he was working night shifts (gotta love the military) and every time my husband rode his motorcycle into the driveway I madly dashed to stash everything into my studio closet and delint the threads from my clothes to hide any evidence of my undertaking. The work paid off though and it came out perfect – and he loves it! If you’d like to see more pictures (I didn’t want to bore you with too much) you can read the full post on my blog A Few Threads Loose.